Well, it finally happened. You drank that Venti quadruple latte and before you knew it, you were offering to organize the summer potluck for your family reunion/book club/local marching band. By the time the caffeine had left your system and your heart rate returned to normal, there you were with a serious case of something akin to buyer’s remorse. Fear not! 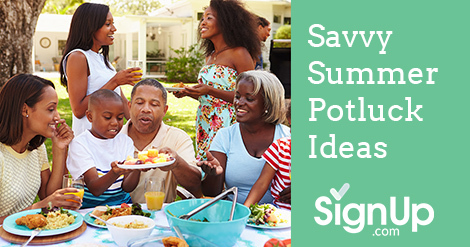 Summer is a great time for entertaining, and the potluck can be the easiest of all events –all you need is a little help with organization and communication. 1. Decide on a structure for the event. Do you want to make the main dish and have guests bring side dishes? Do you want to establish a theme, ask for an assortment of dishes and then round out the menu with your own contributions? Decide which one suits your budget and creativity, and then move forward without too much second-guessing. 2. Keep track of "who is bringing what" with free, online potluck SignUp sheets. Forgo the awkward last-minute phone calls begging Betty not to bring brownies because six other people already are. Free, online potluck SignUps from SignUp.com save you the hassle of organizing and tracking who is coming and what they're bringing. With an intuitive potluck planning wizard and easy-to-use scheduling tools, you can build your online SignUp in a minute and then share it via email or social media. Your family and friends can sign up 24/7 from their computers or smartphones, no passwords needed. There are even ways to keep track of your guests’ food preferences and sensitivities. No more worrying about your gluten-free, sugar-free, dairy-free BFF having anything to eat! 3. Think about the things people might have forgotten, then head to the dollar store to stock up. Plastic serving spoons, netted baskets for protecting the food from insects (if your event is outside,) cutlery, napkins, paper plates –all of these are handy for an informal potluck. Buy some fun outdoor toys if you have kids coming. 5. Relax! A relaxed host makes for a fun party, and you’ve covered all the bases. Because you’ve organized and reminded people about what to bring, you’ll be much better equipped to deal with anything unexpected. It’s going to be great, and next time, you won’t even need that latte to volunteer!